As winter break comes to an end, so does our "season of listening" (for now). What did you notice as you listened more intently over winter break? Use this form to share what you noticed. And what have you noticed about our Sunday School program so far this year? If you'd like to share, Zachary is putting together a Sunday School Task-Force that's open to parents, teachers, youth, and children who are passionate about making Sunday School fun and meaningful. Would you and/or a family member consider being on this task force? Email Zachary at admin@adventnyc.org to learn more. This Sunday, we'll return to our regular Sunday School structure, beginning with song and prayer at 10:05am in the sanctuary, and breaking into small-group lessons based on age. However, this week Zachary has prepared a special lesson for each class about Three Kings Day. We also encourage you to consider sticking around to enjoy fellowship with English and Spanish speaking members of our congregation at this Sunday's intergenerational, bilingual Three Kings Celebration at 12pm in the basement fellowship hall. Details are below. We also have our next Confirmation Class from 9am-12pm this Saturday, and Youth Night from 6-8pm this Sunday for our confirmed and high school teens. Looking forward to a busy, exciting weekend here at Advent! Come join us for our Three Kings Celebration at 12pm Sunday, January 8! This is an awesome opportunity for our English-worshiping families and Spanish-worshiping families to celebrate part of the Christmas story together, so come take part. 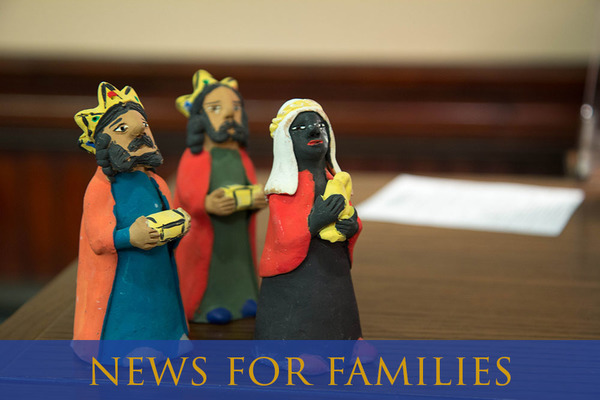 The Three Kings Celebration is a tradition in many Latino cultures, and a festival Sunday for Lutherans. Here at Advent, it includes a big potluck lunch for all, a piñata filled with candy for the kids, a special cake, the singing of traditional songs, and a visit from the three kings (yes, we've got the costumes). It's going to be a lot of fun! Join us!